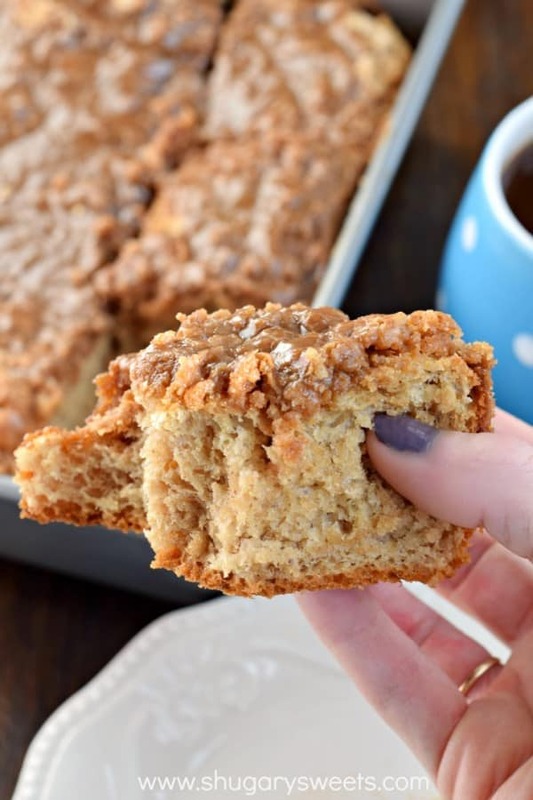 Sweet and comforting, this Cinnamon Maple Coffee Cake is a delightful breakfast! 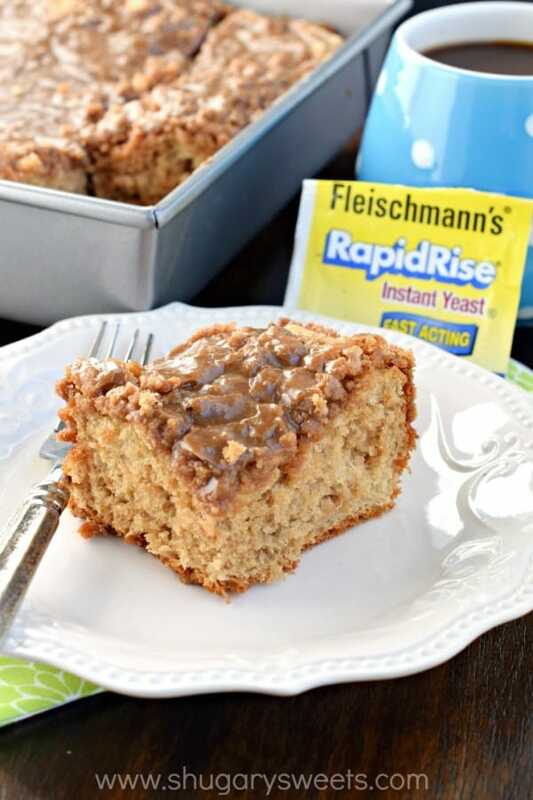 You may all remember a few months ago I made this Cinnamon Apple Coffee Cake for Fleischmann’s® Yeast? Yes? You remember? Do you also remember me telling you how EASY it is to make recipes using yeast? It’s nothing to be afraid of my friends. If I can do it, so can you. Starting the New Year and getting back to the basics is a goal I have heard several of you say back on facebook. So, it’s only fitting that today’s recipe is for an easy recipe you can enjoy with your family anytime and share the love of something homemade and delicious. Don’t fear the yeast, you’ve got this!! By the end you’ll have a delicious breakfast cake to enjoy with a cup of your favorite hot beverage (of course mine would be coffee, duh). 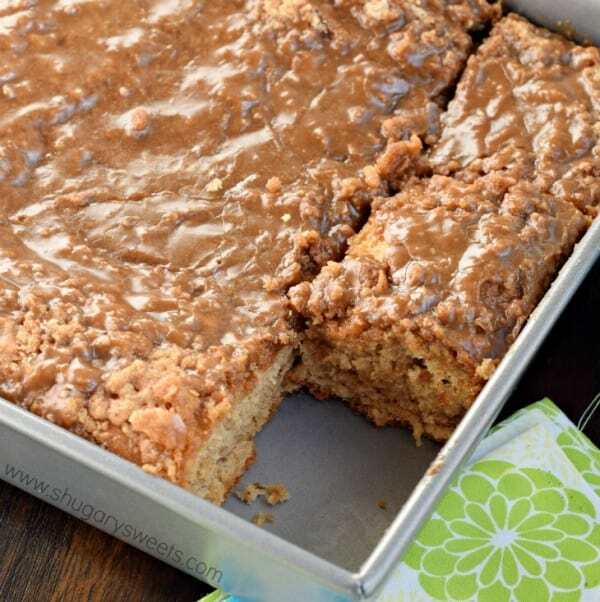 Today’s recipe is adapted slightly from this Beginner’s Cinnamon Streusel Coffee Cake recipe. 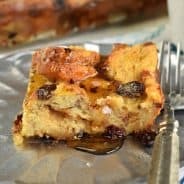 With a few of my own variations and the delicious addition of MAPLE, I think we have something here that you and your family will really enjoy. Last week I asked on instagram (do you follow me??) if you love MAPLE. I’m so glad so many of you said yes. 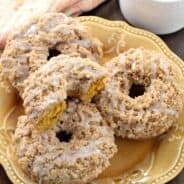 One of my favorite donuts is a Maple Glaze, so I knew adding this flavor to the coffee cake would be delicious. I also added some maple into the dough mixture, as well as some extra cinnamon and nutmeg! It turned out fantastic you guys. You’ll want to double the batch to bake a little extra and pass on all the maple deliciousness and make someone’s day. I have to say the edge pieces were my favorite. They had a chewy texture (like a cinnamon roll), and the buttery streusel topping gave this a little extra crunch on top! Two thumbs up from this girl. When heating the water and butter, do NOT overheat. I use a kitchen thermometer for this (you can find these at most Target/Walmart/etc). You don’t want to scald the yeast (because then it won’t rise). Once you’ve made the “dough” and pressed it into the pan, cover this with a clean kitchen towel and allow it rise for about 45 minutes. My house is very cold right now, so I stuck mine inside my microwave (not turned on, of course). It’s nice and warm in there…I wish I could have crawled in myself! While the dough was rising, I whipped up the streusel topping. You can use a pastry blender to cut in the butter, but I always find using my hands works best. You want to mix until it’s “crumbly” with small pieces of butter still visible. After baking, allow the cake to cool slightly before adding the glaze. I recommend that you store it covered at room temperature for up to 3 days. Mine started to get a little stale by day 4, but I popped a piece in the microwave for 15 seconds, and it was perfect. So there’s that. And there you have it, a delicious breakfast cake that’s easy enough for beginner bakers! You’re going to love this one and your family will too! Bake it now or bookmark it for later to serve your family a delicious breakfast this weekend! Surprise your neighbor or family member with an extra batch. In a small saucepan, combine water and butter for the dough. Heat until very warm (and butter is melted), to about 120-130 degree F.
In a large mixing bowl, add 1 cup of the flour, yeast, sugar, and salt. Add water mixture and blend together. Add in the cinnamon, nutmeg, maple and egg. Mix until well combined. Add remaining 1 cup of flour and beat for about 2 minutes, scraping sides of bowl as needed. Pour dough into a greased 8x8-inch baking pan. Cover with a clean, dry towel and let rise in a warm place until doubled in size (about 45 minutes). While dough is rising, combine streusel ingredients with a pastry blender or your hands, until very crumbly. Set aside. When dough is ready, sprinkle streusel evenly over the top. Bake in a preheated 350 degree F oven for about 35 minutes, until golden brown. Cool slightly on wire rack. While cooling, prepare glaze. Whisk together the powdered sugar, milk and maple until smooth. Drizzle over warm cake. Slice and enjoy! Oh my goodness. Maple is my crack. Really, it’s the best. And when you combine that with a yeasty, warm cake…this is me wishing I could launch myself through the screen and grab some. Or all of it! Mmm I do love maple and this cake looks like the stuff dreams are made of!! Oh my goodness, this coffee cake looks amazing. I need some with my coffee!! This is my kind of cake. I love maple anything! Looks delicious. Yeast totally scares me still but if you say it’s easy I believe you! 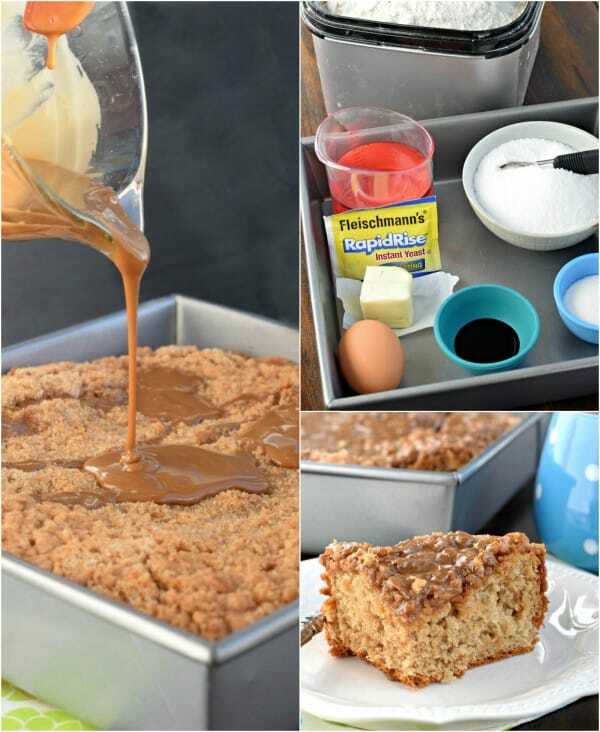 I’m going to attempt this delicious coffee cake! All that glaze and crumble is making me go weak in the knees! I’m pretty sure I would just keep eating all of the edges and then the center…sharing sweets is not one of my strongest traits. My jeans can testify to that! I bet this smells heavenly while it’s baking……it looks so moist and incredible! Do I love maple? I would BATHE in maple. This cake is amazing! That streusel and that glaze!!!! Gah! I can only imagine how delicious this is! I am straight DROOLING over this! Oh this coffee cake looks SO good, Aimee! I absolutely love maple, so I can only imagine how delicious this must taste when combined with cinnamon. Delish! I’m not a big cake eater, but this cake looks irresistible Aimee! This looks amazing! But can i you tell me is the difference between maple flavoring and maple extract? TIA! Looks amazing Aimee, can’t get much better than cinnamon and maple sugar! It looks very tasty. Will try it. What a great way to start a day! The glaze and streusel take this over the top! To me, the flavours here are absolute heaven! Whoever came up with the cake for breakfast idea is a genius! This looks super tasty! 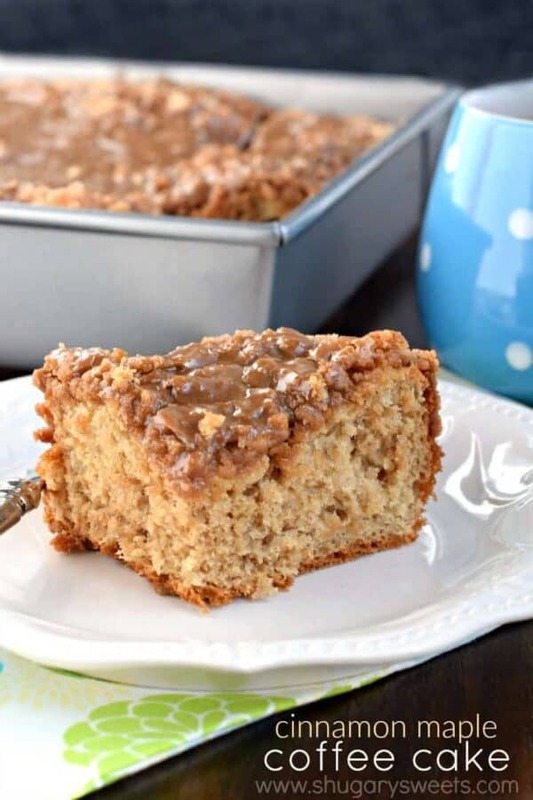 Lord I love coffee cake, especially when it has maple…the best of flavors! I am weak when it comes to coffee cake. I will never say no and then you went and drizzled that maple glaze on top. Just perfect! 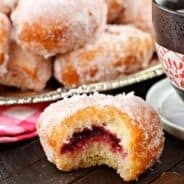 Could you make with maple syrup instead of extract? The extract has a concentrated maple flavor, syrup just doesn’t have the depth in maple that the small amount wouldn’t make a difference. 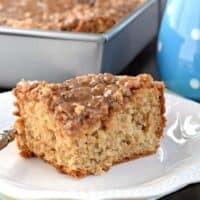 I am always looking for coffee cake recipes and LOVE maple!! Since I can’t be trusted not to eat the whole thing, have you ever had enough left over to try freezing and how does it hold up? I haven’t frozen this one specifically, but I think it should be fine if you freeze it! Maple flavoring and maple extract are both listed as ingredients. Can you just use maple extract where is calls for maple flavoring?